When keys, loose change, credit cards—or even your phone—get stuck in hard-to-reach places, ODii can give you a hand. This grabbing tool has a tiny claw that lets you control the grip. It’s like a mini version of that arcade claw game, but it doesn’t let go. Squeeze the handle firmly for a tighter hold. For a more delicate item, ease up on the grip. The slim, flexible body bends to navigate awkward angles—like behind the fridge, under furniture, or between the seats in the car. For extra help, a super strong magnet holds up to two pounds, and a detachable LED light brightens up the search area. Creator Kenn Buxton invented ODii after an unfortunate trip to the drive-thru. He dropped his cash between the car seats, and was unable to pay because he couldn’t reach it. 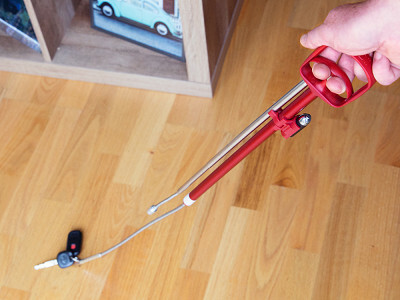 With this grabber in a kitchen drawer or your glove box, you’ll be ready next time something drops out of arm’s reach. Hello Grommet fans and supporters. I'm super pumped to be here with you today, answer your questions, and share my story. Being here, with you today, is an honor and a dream in progress. Now you are part of my story. I’ve been thinking of uses for this for the last few minutes and I’ve come up with 1,000. How did you get the idea for such a universal problem-solver? ODii is definitely a comprehensive problem solver and I, myself discover new uses daily, but my initial a-ha moment came from a nuisance I constantly encountered while in my vehicle. At least a few times a week, I would drop my phone, credit card or money in between my car seat and console. Retrieving my items proved to be a daunting task and I was tired of playing twister with my vehicle every time I tried to fetch my belongings. The final straw was when I went through a drive through with my daughter and dropped a five dollar bill between my car seat and console. I hadn’t brought my wallet, and neither my daughter nor I could reach the money so we were out of luck. After that incident, I knew this was a universal problem and I was committed to solving it. What was the process like of narrowing down what elements were included and what the product actually looks like? My main goal was to design the world’s first telescopic, flexible claw, and that’s exactly what I accomplished. Right from inception, I wanted to create a cool aesthetic design appealing to men and women without compromising the essential functionality. I researched and tested every pick up tool on the market. Before the making of ODii, what you would find in stores were tools designed to work around engines that were bulky, unattractive and usually only served a single function. I needed the design to accommodate very tight places, serve multi-functions and be compact while not in use in order to be stored it in my glove compartment, kitchen drawer or tool box. I feel silly asking this, but why should everyone have this in the car/house? I am absolutely convinced that every car and household needs an ODii. The most rewarding part of this process for me so far is hearing all of the unique uses customers have found for their ODii, even beyond what my initial thoughts were. ODii saves time and frustration in your every-day life. Once you have one, you will wonder what you have done without it in the past. Just think of other common household tools such as the age-old hammer. Sure, we could use a rock or other heavy object to put a nail in a wall, but the hammer is so much more effective. You will find the same once you have your ODii. You will finally have an easy way to retrieve all of your lost items in your car and your home. 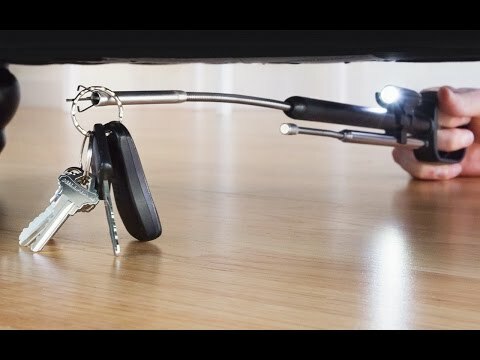 In your car, you can fetch your phone, credit card, pens, earrings, food, cash, all of those tiny items that fall down that mini-abyss between your car seat and console. In your home, you and your family can use ODii to reach down your drain, garburator, behind and underneath your furniture, down vents, anywhere you can’t reach by hand, ODii can help! I feel strongly that once you have this little gadget in your own home, you will be reaching for it time and time again. How long is the reach? My husband is in a wheel chair and has much need of a grabber but this does not look long enough. Hi Anita, it is 23" fully extended. I'm concerned about the magnet...won't such a strong magnet injure credit cards and electronics? @Lesa Hi Lesa, the magnet wouldn't be used to retrieve your credit card and would not come in contact with it. 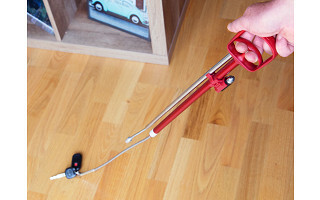 We designed the easy grip claw to retrieve such items that are not magnetic or where a magnet could be harmful. @Kenn I must have this brilliant invention! @Karen Thanks so much Karen. We know you will love ODii! @Kenn I just placed my order! @Kenn — so the magnet is removable? Or what? I can't tell from your answer to Lesa. @Francine Hi Francine. The magnet is detachable and extends 23 inches. 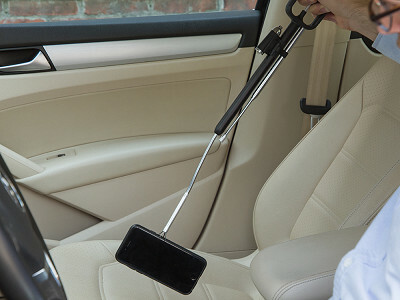 It also has a flexible end for maneuvering awkward and hard to reach places. @Kenn ODii is three tools in one that can be separated and used independently. This makes ODii extremely versatile. How wide does the claw open? Would it possibly pick up a ceiling fan remote that dropped behind my son's massive bed/dresser/bookshelf that's impossible to move? @Jennifer Hi Jen, The claw opens 1 inch and can easily lift a remote. I just tried in on three of my remotes to double check and it easily retrieved all three. @KEN Hi Ken, T-Shirts would be a great idea but something not on our radar at the moment. I'm glad you like the design though. This is something we would consider if/when we launch a new product on The Grommet. This seems like a wondertool for parents whose kids are always dropping things under and behind things (like mine are). Definitely better for grabbing pacifiers behind than crib than the bent wire hanger I've been using. I know it would bump the price up a lot, but have you considered adding a wireless camera to the end, so you can see things you know are down there, but can't actually see? @Eric Hi Eric. A wireless camera would be absolutely awesome but would have a significant impact on pricing. We did think about many options, but to keep the price point accessible, we focused on what we thought were the most important components this time around. Cameras are something we would focus on as a specialty item in the future. Looks like this is just a different version of the Mechanic's Helper that can be bought at any hardware store for much less. @Arline Hi Arlene, what make ODii quite different from what's on the market is a few things. 1. ODii is the only telescopic compact claw on the market designed for men and women. The Mechanic's Helper as you mentioned says it all. It was designed for a mechanic, not the everyday person to solve everyday frustrations like ODii does. 2. It is the only claw on the market where the operator controls grip strength and not a spring. You can lift much heavier items with ODii. 3. ODii is compact and deigned to be kept in a kitchen drawer or your vehicle's glove compartment. @Kenn Any chance this is made in the USA? @Rick Hi Rick. We contacted many manufacturers in the US and Canada for pricing on molds and assembly but the costs were much to high for a start-up like ours. ODii would have been priced out of the market. We would love to bring manufacturing home if we could and do hope to in the future when our batch volume spikes. If you have a solution we are all ears. For those who know what geocaching is, this would be a perfect tool for my bag. Right now I have a magnet stick and used to carry a bigger grabber stick, but that got to be too cumbersome. This looks like the perfect solution. If you don't know what geocaching is, look it up . @Donna I opened up this item for the exact same reason...geocaching!! now if it could find the micro in a pine tree, it would be PERFECT! HA! @Kenn Can you give me an idea of the circumference of the grabber when closed? I am a circular sock knitting machine ( looks like a meat grinder if you remember that device) knitter and am forever dropping stitches. Looks like ODii would be perfect for retrieving a dropped stitch as long as the grabber end will pass through the loop of knitting. @Susan Hi Susan. The circumference for the claw when closed and the magnet are .25 inches or 6.35 millimeters. @Kenn Thanks for the prompt reply! I am going to give it a try. @Susan You are going to love ODii Susan! @jeanette. If you invent the "finder" of the cache in the pine tree, I will buy it. What specific kind of battery does it use for the light -- and does the magnet or the claw operation require any power source? If so, what kind of batteries? @Guest ODii requires 3 AG 13 button batteries that are INCLUDED and ready to go. 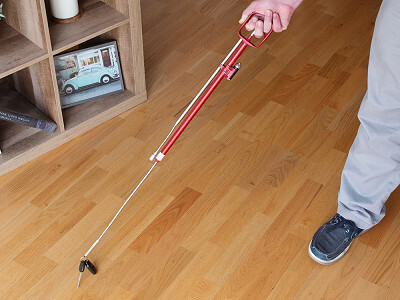 The telescopic flexible claw and the telescopic flexible magnet operate manually and very easy to operate. I hate to burst your bubble, but we had these when I joined the Navy over 40 years ago. We called them "bilge pickers," as we were always getting stuff out of the bilges or other hard to reach areas. I have seen them elsewhere and some with lights. @Larry No bubble to burst Larry… shoes and cars have also been around for 40 years and they keep getting better. ODii is a new twist on something that hasn’t changed since you were at sea. Our customer isn’t the heavy duty mechanic, it’s the everyday person with everyday frustrations that we provide a cool new approach to solving. ODii is designed to fit in your vehicles glove compartment or kitchen drawer and appeal to men and women of all ages. Hi Carol, I used it to get my phone, too, and I didn't have any trouble with scratching. As long as you have a screen protector, you won't have a problem.